This multi use development is unique, not only in Halifax, but in the Atlantic Canada region. It contains a three level specialty shopping centre with eight cinemas and a food fair, on the lowest subgrade level. 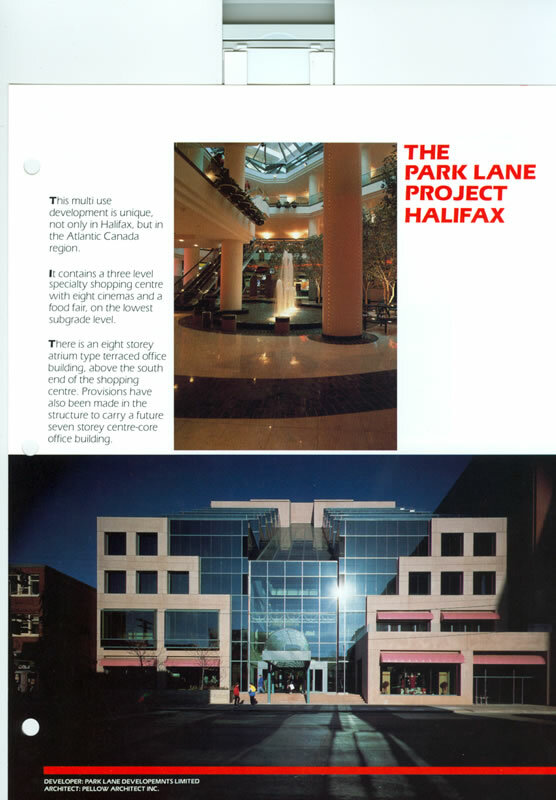 There is an eight storey atrium type terraced office building, above the south end of the shopping centre. Provisions have also been made in the structure to carry a future seven storey centre-core office building. To satisfy the complex nature of the development various systems of reinforced concrete slabs, beams, and related framing were designed to satisfy not only the architectural criteria, but the needs of all the other design disciplines, whose requirements had to be coordinated within the structure. The 18 metre clear spans required by the cinemas, located in the basement of the structure dictated the extensive use of transfer beams, up to 2.2 metres in depth .